THE FIRST BOOK ON NEURO-SEMANTICS META-STATES – If you want a thorough understanding in Meta-States, this book is a must. It presents the history of the discovery of the Meta-States model, a full description of the theoretical foundations for the model, how it fits into the Neuro-Linguistic Model and then building upon it, extends it to include the higher or meta-levels. Originally written in 1995, this second edition represents a complete re-write of the book, simplifying the model, adding two new chapters, streamlining the original work, and including the more recent developments to the Meta-States and Neuro-Semantics model. While you can obtain a more simplified approach to Meta-States in Dragon Slaying, Secrets of Personal Mastery, Mind-Lines, etc., this book will provide the meat of the model itself, especially for those interested in advanced modeling using meta-levels, and the direction of Neuro-Semantics in the 21st century. Meta-States refers to the richness of our mind as it reflects back onto itself to create layers upon layers of “mind” or conceptual states and since these higher states then become our higher frames of mind, they create our “beliefs,” “values,” “identities,” etc. In this Meta-States offers a third meta-domain to NLP and a unified field theory for including all of the logical levels of Dilts, and the “other logical levels” never before articulated and utilized. Dr. Bobby Bodenhamer has provided a descriptive Forward that sets forth the contents of the book and explains its values. A most for anyone who wants to stay current in the field of NLP. other models work. And, he does this in such a way that you can understand it, try it on, experience it and make it a part of your ever day life. I got involved in studying NLP in 1989. In 1990, I made it the major focus of my work and study. The model absolutely fascinated me. Over the next five or six years I found myself getting bored as I “thought” I knew everything that there was to know about NLP (Of course I didn’t, I just thought I did.). Then I met Michael Hall. And, what a difference he has made in my life. He ever so gently introduced me to his Meta-States model as we worked together in developing new materials for our joint works. As time progressed, I realized that we were on to something big, real big. The time required for me to get changes in my therapy clients was drastically reduced. Now, realizing that as a rule, NLP works quit fast already, this both amazed me and convinced me of the efficacy of Meta-States. 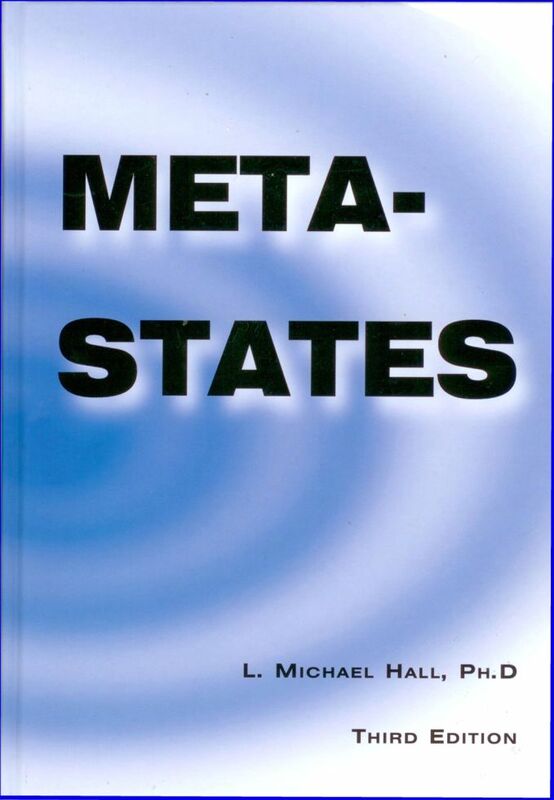 I began to pour through the first edition of this book that Michael published in 1995, Meta-States: A Domain of Logical Levels I did not waste my time. Meta-States has revolutionized my NLP training courses, my therapy work, my ministry, and my writing. I can’t imagine teaching NLP without the Meta-States model. Why? Simple, Meta-States explains what works in NLP, what doesn’t work, and how to determine the meta-level or meta-state that makes the difference. In this volume, Michael has done us all a favor by completely re-writing the first edition. This edition has the accumulated knowledge and experiences of the last five years of Michael’s trainings, consultations, research, feedback, etc. And what a volume he has produced. As Michael says, “I have reordered the structure of the book dropped chapters, added chapters and expanded the Meta-States model. The material has been extensively reordered in order to make the reading easier. I have included many new facts to the model that was not in the first book. During the past five years I have changed my mind about two or three key factors about the model. I have included these correction in this volume. ” If you read the first volume, by all means don’t imagine that you “have it all.” This edition takes the Meta-States model and greatly expands it. You will also find this volume much more readable as Michael has prepared this volume for a much wider audience. Chapter 1-The Discovery of Meta-States – In this chapter, Michael defines the fundamentals of the Meta-State model. Drawing from what he refers to as “unmined resources of General Semantics,” he describe “how” the mind structures perception and therefore, mental states. In this chapter you will learn about your “self-reflexive consciousness” (thoughts about thoughts) that drives your behavior. Chapter 2 –The State of Our States – Discover in this chapter the “two royal roads to state control: mind and body.” Our mind-body interaction determines the quality of our lives. Here, Michael introduces the power of “state management,” or “How to run your own brain” rather than letting others and/or external circumstances run it for you. A most informative chapter. Chapter 3-The Higher States of Mind – Here you move into those higher thoughts that you have that “set the frame(s)” for your perception-behavior. He says, “We cannot help but make conceptual moves to a higher-frame of reference and react to our reactions. Self-reflective consciousness describes the mechanism that makes this possible.” Learn about your “executive states for consciousness” that literally rule your life. They can work for you or against you. And, guess what? They are not set in concrete. You can “change” them. Chapter 5 – Meta-States as a Model – As is the case with NLP, Meta-States function in accordance with specific operating principles and guidelines. Because they do, one can learn “how” they work and therefore “replicate” them. This means, you can discover “how” people utilize their self-reflexive consciousness to produce their excellence and replicate that same excellence within yourself. Meta-States adds the “missing piece” in NLP and makes “modeling” a reality. This chapter describes in detail this fascinating addition to NLP. Chapter 6 – NLP Precursors of Meta-States – Here credit is given where it is due as Michael takes us into NLP to reveal how Meta-States has been there all along. As he does this in such a way that gives credit where it belongs, this reveals his own scholarship. Chapter 7 – The Meta-Stating Process – In NLP we believe that each person carries within the resources needed to reach his or her outcomes. This chapter presents the process of how to construct empowering Meta-States to attain your outcomes. You begin the journey of learning how to “de-construct” your negative states and then how to construct positive ones. Chapter 8 – When States Transcend – A key work from NLP, Core Transformations by Connirae and Tamara Andreas, empowered many in and out of the NLP community in how to run their own brain and how to teach others to do the same. The essence of the model expresses a meta-stating process. For those of a more “spiritual” persuasion, this chapter offers the structure of spirituality. Chapter 9 – Meta-States as a New Epistemology – Some have said, and I think rightly so, that NLP at its essence is an epistemology. This chapter presents the epistemology of Meta-States. Here Michael gives credit to the genius of Gregory Bateson as presented in his classic work, Steps To an Ecology of Mind. To tackle the intellect of Bateson is to tackle a champion, Michael does that along with the genius of Korzybski (Science and Sanity; General Semantics) regarding self-reflexive consciousness in the development of the Meta-States model. The reader will find in this chapter an “understandable” treatment of the extremely difficult to understand work of Gregory Bateson. This chapter is a must read for the scholar. Chapter 10 – Meta-States as the Power to Frame – Now we get to the “difference that makes the difference.” Each individual operates from perceptual “frames” both conscious and unconscious-mostly unconscious. These frames determine our beliefs, values, personality, emotions, reactions, how and what we sort for, etc. Guess what? The good news is that they are not set in concrete. They can change! How do we change them? By utilizing the skills in this volume to re-frame ourselves. If your tendency is to always look for the worse, you can learn to look for the good. If your tendency is to look at the big picture when you need to look at the details, you can learn that also. You can even shift something as strong as your beliefs and values. You can take your brain pretty much anywhere you want to and set those “frames” that will serve you. Chapter 11- Design Engineering With Meta-States – How would you like to actually design states of consciousness as we design a house, a new outfit, etc? You can. By using your self-reflexive consciousness, you can start layering thoughts and feelings that will produce those states of consciousness that will serve you well. Interested? Chapter 12 – Meta-Stating Proactivity – We have problems often times because we live at some presupposed effect of some cause. By meta-stating ourselves with a higher frame of proactivity we give ourselves the power of choice-we move from being an “effect” to being “at cause.” This chapter will show you how to transcend your environment (the primary level) and access your higher frames (meta levels) that will empower you to take charge of your life and action. This is one of my favorite chapters. I found this chapter alone worth the price of the book. If practicality rates high on your value list, this chapter will delight you. Chapter 13 – Meta-Stating Resilience – As Michael gives eighteen key components for mastering resiliency, the ability to bounce back, he identifies those meta-states essential for resiliency. You’ll also discover that it was from the study of resiliency that Michael originally developed the idea of meta-states. How do people “bounce back” from a defeat? What makes the difference in those who get knocked down and stay down as opposed to those who get back up and go on? This chapter gives you the “recipe” for bouncing back from defeat. A must read. Chapter 14 – Meta-Stating Self-Esteem – Have you struggled with low self-esteem? You don’t need to any longer for in this excellent chapter, Michael teaches us “how” to “esteem” ourselves. You will learn how to “design” your own self-esteeming program that conforms to your own beliefs and values. Chapter 16 – Meta-Stating Un-Insultability – How do you react to criticism? This chapter provides both the knowledge and the “how to” of turning your critic into a friend. Michael is not talking about becoming hard. No. He talks about building an “empowering center out of which to live, think, relate, work and respond.” Another very practical chapter. Chapter 17 – Meta-Stating Magnanimity – This chapter moves the reader in the direction of philosophy. Defining magnanimity as “loftiness of spirit enabling one to bear trouble calmly, disdaining meanness or revenge,” it already sounds like a meta-state process to me. This chapter could have been entitled: “How to Overcome Frustration.” It’s good stuff for developing a “sweet reasonableness” in life. Chapter 18 – Dragon Slaying/ Taming: De-Constructing of Meta-States – As we can meta-state ourselves sick, we can meta-state ourselves well. If you become afraid of your fear, you become paranoid. If you become curious about your fear, you may learn from it. If you become calm about your fear-what happens? Because this book describes the “how to” of the construction of our states, this book teaches us how to de-construct our negative states-slay those dragons. The author has an entire book by this title. This chapter gives you the essence of how to tear down, break apart and ultimately destroy your stinking thinking. Interested? If by now I have stirred up your interest, then take this volume, head off to a quiet place, and begin a journey such as you have never traveled before. You will visit places in that wonderful mind of yours that you did not even know existed. You will discover “powers” of choice that you never dreamed of. Indeed, I do believe you will finish this volume saying, it has been good. And, I predict, that you will pick it up many times as you mine the treasures contained herein.